We were speaking with our adoption agency social worker, when she noticed that our application indicated that we have experience with hemophilia. At the time, we had 3 children, my oldest son being affected by hemophilia. Immediately our case-worker (Pam) recalled an adorable little boy she met during her previous trip to Nanjing, China. He was an 8-year-old boy with hemophilia, and was not considered eligible for adoption. When Pam told me about this precious little boy in China, a 10 minute conversation began a small action that multiplied like the ripples in a pond when a pebble is tossed into it. Several months later my husband Dave and I received an email that would change our lives forever. The email merely indicated that an 8-year-old boy lived in China with hemophilia, spending many weeks in the hospital each year, and he ultimately needed a family. Since I have known hemophilia my whole life, it wasn’t the scary part for us. My older brother by 3 years had severe hemophilia B, he unfortunately passed away from AIDS related complications in 1993. With safe treatments and no more risk of HIV or AIDS, my husband and I moved forward with our family. Our oldest son has severe hemophilia B with inhibitors; I was diagnosed with mild hemophilia and a platelet dysfunction after post-child-birth complications; our twin daughters have platelet dysfunctions and one has mild hemophilia. We know and understand the challenges of living with hemophilia. For us, adopting was the unknown territory. However, within days of receiving that email we felt led to contact Pam and we were sprinting down the “adoption paper chase” trail. The adoption process varies from country to country. For our adoption, we needed pre-approval from China, a home study from a local adoption agency, online training for older and special needs children, various legal papers and forms completed, and everything sent to China for authorization and approval. Our process took about 9 months from start to finish. The cost associated with a China adoption is currently around $35,000 including travel. These fees are due at different intervals throughout the process. Many people are frightened by the high cost of international adoption. However, numerous individuals have been able to acquire grants and fundraise enough to cover a large percentage, if not the full amount of their adoption costs. When we were united with our son in January 2010, he was quite frail and had a slight limp. He had a target right knee that had repeatedly bled over the years and was rather swollen. He spent the majority of his time with us in China in a borrowed wheelchair. Within a week of coming home we took him to the Hemophilia Treatment Center (HTC) to see the hematologist for a full evaluation. We had arranged this appointment ahead of time and requested a mandarin speaking translator, which was very helpful. Lab work was completed that day, as he had a toe bleed and severe hemophilia A was the confirmed diagnosis. He received a dose of factor VIII and upon waking the next morning with his toe feeling better, he gave the thumbs up for his new medicine. He soon began physical therapy for his knee and prophylaxis (preventative treatment) twice a week. Over the course of the next several months, he made amazing progress, growing physically stronger and regaining full use of his knee. The first summer he was home, he was able to attend Camp Bold Eagle where he learned to administer his own medication and is now independent. With occasional breakthrough bleeds that first summer, the hematologist increased his prophylaxis to three times per week. Remarkably he has not had a bleed in 6 years. The ripple effect for our family has been substantial. Our son is physically strong and healthy and he has family and friends who love him. He is an excellent student, beginning his sophomore year in high school this year; he plays violin in his school orchestra, and participates in team sports. Last year he rowed on the crew team with his sisters, and he enjoys running and riding his bike. This past year I began working part-time in conjunction with the Hemophilia Foundation of Michigan (HFM) as the Advocacy and Outreach Coordinator. 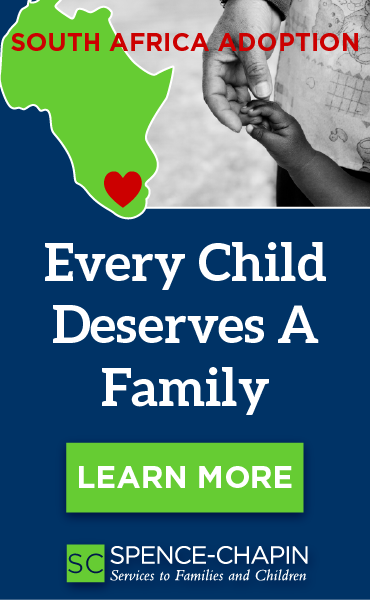 HFM has partnered with me to help further the reach to find forever families for children with hemophilia and to create educational materials and resources for hemophilia adoption. Since helping our family become complete, Pam was inspired to begin a crusade and search for boys with hemophilia in China. She locates the boys, educates the orphanage staff and China Adoption officials that there are families in the U.S. open to adopting children with hemophilia, and she advocates for families on behalf of them. In the past two years she has matched more than a dozen boys with hemophilia to their forever families. When Pam has a boy with hemophilia that is ready, she contacts me, Melissa, and several other moms in the hemophilia and adoption communities. We then go to work advocating for their forever families to find them. Several other adoption agencies are now beginning to advocate for boys with hemophilia. I have recently talked with agencies that have partnerships in Eastern Europe, Columbia, and the Dominican Republic that are ready and willing to advocate for children with hemophilia in need of families. One mom, who adopted her son a few years ago, started the Hemophilia Adoption Facebook page. This private group consists of those that have adopted a child with a bleeding disorder, are starting the process, or considering adopting a child with hemophilia. We are creating a network of advocates, mentors, and experts in hemophilia adoption. This community is growing as more children with hemophilia are adopted into forever homes. The sense of comfort realized when families understand there is a support system specifically for hemophilia adoption and they are not alone on this wonderful journey is remarkable. In April of this year, I had a 5 minute conversation about waiting boys with hemophilia with a gentleman at a hemophilia event that I was attending in Michigan. He in turn spoke to his son and daughter-in-law who live in another state and relayed the information about waiting children with hemophilia. As a result his son and daughter-in-law are now in the process of adopting a sweet little boy with hemophilia. It continues to amaze me how far reaching the ripples of a conversation or an action can spread. I recently did a count of all the families I am aware of with adopted children with hemophilia or in the process of their adoption and came up with an astounding 23 families. I certainly cannot say that all of these children were adopted because of a single conversation that happened 7 years ago, but I truly believe that many of these children would not have their forever families if that pebble had not been tossed into the pond by Melissa and Pam. 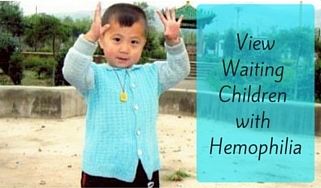 Countries, particularly China, are now becoming educated that children with hemophilia are indeed deserving of a chance to find their forever families. As a result more and more children with hemophilia are being adopted. 7 years ago when Luke was living in an orphanage, it had never occurred to his caretakers to attempt to find a family for him. We are so thankful that Pam and Melissa had a conversation that would send ripples through our lives and continue to flow through the hemophilia community and beyond. I am so blessed to be a part of this ever growing community, and to witness families finding their forever sons.